Civil War period extremely rare hand sewn woman's dress. 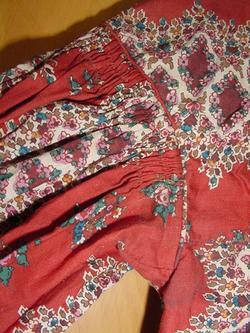 I have taken photographs from many angles and places on this dress. In very good to excellent condition for age, missing a few hooks and possibly two busks but otherwise complete. 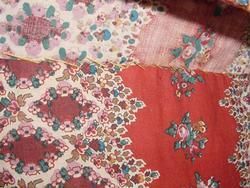 Wonderful cotton patterned cloth, 3 natural material busks as photographed with two possibly missing. 26 inches top of shoulder to edge of sleeve, 4" wide collar, 15 1/2 inches armpit to armpit; 14 1/2" edge of collar to waist; 34 inches waist to edge of dress; 7 inch hem; 48 1/2 inches edge of collar to edge of dress. If any other measurements or questions please email me. My guess is this is a maternity dress based on the fitted back but very loose front. The fitted back and loose front, with fitted inside lining, is typical of a wrapper. 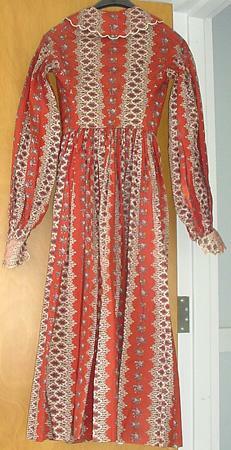 Worn with a belt, it would be not unlike a dress, although the self-fabric collar also marks it as a wrapper. It could have been worn for later stages of pregnancy with the front lining left undone and without a belt (or the belt hiked up), but I don't think it's an actual maternity dress. I love the wild print and the scalloped edges. The tape loop is probably for hanging it in the wardrobe. A recommended way to hang dresses is to turn them upside down and let the skirts fall wrong side out. 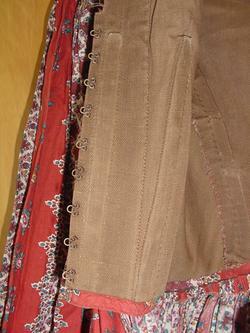 Then the dresses can hang from tapes attached at the waist, structurally the strongest part of the dress. 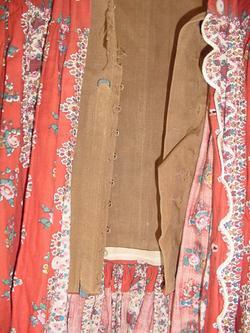 The bodice, hanging underneath/inside the skirt, is completely protected by the skirt from light and dust, and the skirt itself will not fade because only the wrong side is exposed. Ah! Okay, I wasn't sure. I thought it might be a wrapper but the fitted back threw me. Thanks! And the part about the tape is cool too! 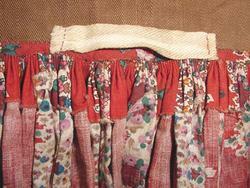 Anna McClurg's (formerly Allen's) website has some great images of 1860s wrappers. 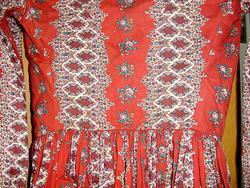 The green wool one with red silk trim is the inspiration for one of mine. I've actually made two in this style. Wrappers are a lot of fun!